A three-foot-tall stalagmite is back home in West Virginia after spending nearly 50 years in Franklin County. The 100-pound chunk of calcium carbonate was displayed at a college, supported a bird bath and survived the Agnes flooding. But for most of its 48 years on the road, the rock has been hidden in storage. Four members of the Franklin County Grotto returned the formation in October to Mystic Cave in Pendleton County, W.Va.
"When you own formations you might unintentionally encourage people to acquire one for themselves," said Grotto Chairman Kenneth Jones, Chambersburg. "That's why we prefer that people not own cave formations. It's a monkey-see, monkey-do thing." Jones suggested that the organization of spelunkers return the stalagmite. Glen Sarvis told them he had stored the stalagmite about 20 years for a friend in his barn near Mechanicsburg and he was intending to sell the farm. "When I brought up subject they were quite excited about doing that," Sarvis said. "It seemed the right thing to do from the ecological and conservation standpoint. Everybody is pleased the way it worked out. I'm thrilled we were able to do it." The group got permission from the owner of the cave, wrapped up the mineral and drove three hours to the cave. "Even with four of us carrying it, it was a chore some places," Sarvis said. "We had to go down a waterfall and up another waterfall to get to the Formation Room." 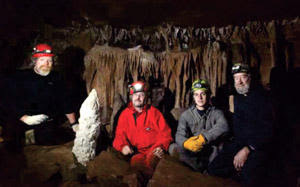 Sarvis, a 69-year-old retired biology teacher, joined John Boswell of Carlisle, Gordy Ley of Fairfield and Stitch Rentzel of Messiah College, Grantham, to reset the stalagmite. They positioned it between chunks of broken travertine to hold it upright. The spot is probably upstream from its original location, according to Sarvis. Sarvis suspects that the stalagmite was broken off the cave floor during a flood sometime before 1962 when he first visited the cave. He said he knows the man who took it in 1962 or 1963, but identifies him only as "Rich." "I can't imagine him breaking anything," Sarvis said. "I assume he had other people with him. I can't imagine one person carrying it." He suspects Rich picked up the piece from the clutter where two streams meet near the cave entrance. State governments have since enacted laws to protect caves. West Virginia's cave protection law imposes penalties of up to $500 and six months in jail for disturbing a cave formation without the owner's permission. Pennsylvania's law carries a fine up to $100. When a reporter contacted Priscilla Teter, the 94-year-old owner of the cave, she was concerned that the spelunkers might be in trouble for returning the stalagmite. "It's all right, isn't it?" Teter said. "They were good enough to bring it back. It doesn't make any difference to me because I've never been in the cave. I didn't know it was gone to tell you the truth. I couldn't say anything about it anyway. It didn't belong to me." Her aunt, the late Hester Raines, owned the property when the stalagmite was taken, she said. "I'm sure she didn't go in the cave," she said. - Rich took the formation in 1962 or 1963 and in the fall of 1963 allowed it to be displayed in the window of the bookstore in Old Main at Shippensburg State College. - A member of the SSC Grotto was suspected of removing the stalagmite and it was found in his front yard supporting a bird bath. 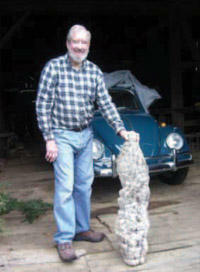 - Rich took it back and kept the stalagmite until the 1990s when he moved it to Sarvis' barn. He died in 2005. Rich claimed that the stalagmite saved his shed in 1972 when the remnants of Hurricane Agnes flooded the Conococheague Creek. It was braced against the upstream side of his cabin on Social Island Road. His neighbor's cabin was washed away. The Mystic Cave stalagmite was shaped over thousands to tens of thousands of years, according to Thomas Feeney, associate professor of geography and earth science at Shippensburg University. Water drips through carbon-rich soil and rock, he said. When the drops enter a cave, carbon dioxide comes out of the water like carbon dioxide comes out of a soda drink. Thin layers of mineral form stalactites on the ceiling. A drop splashing to the floor leaves a thin film, and layered over time shapes a stalagmite. Stalagmites are not rare, but returning them is, Feeney said. "Quarrying operations break them up all the time when they encounter them," Sarvis said. "We try to protect them when we can." Cave vandalism is always going to be a problem as long as people go in caves and figure there's treasure to harvest, Sarvis said. The Mystic Cave stalagmite is back on display in the darkness where spelunkers can rediscover the treasure by lamplight. A stalagmite from Pendleton County, W.Va., has been more active in the past 50 years than most other karst formations. 1962 or 1963 -- Taken from Mystic Cave. Fall 1963 -- Taken from a display in the Shippensburg University State College bookstore, then retaken by the man who took it originally. June 1972 -- Survives Agnes flooding of the Conocochegue Creek at Social Island. 2005 -- The man who removed the stalagmite from the cave dies. March 2011 -- Sarvis wants to sell his farm and asks fellow spelunkers what to do with the stalagmite. They suggest returning it. October 2011 -- Returned to Mystic Cave.